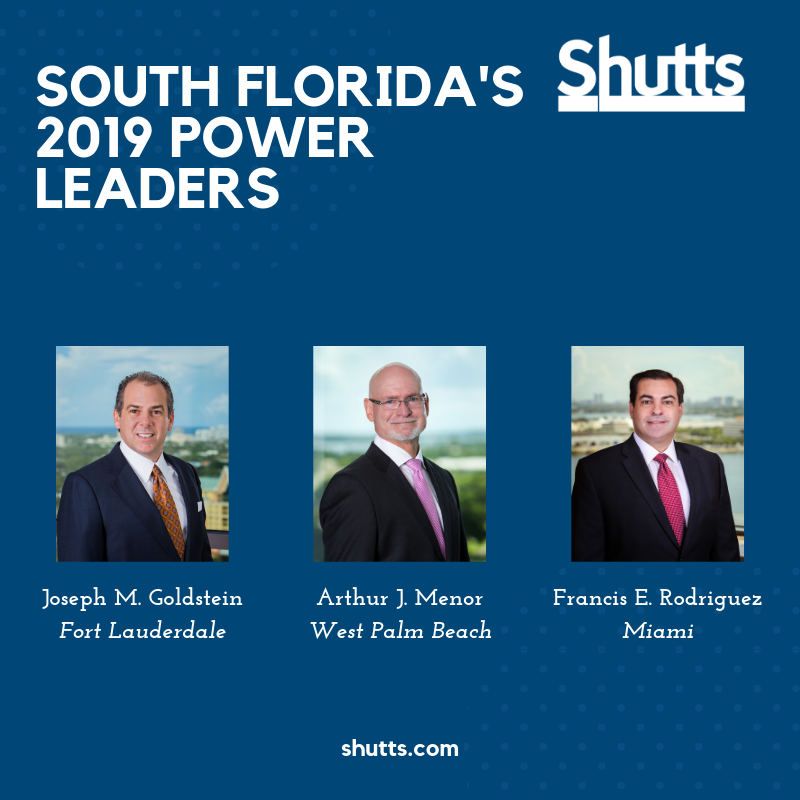 Joseph M. Goldstein is the Managing Partner of the Fort Lauderdale office of Shutts & Bowen LLP, where he is a member of the Business Litigation Practice Group. A Martindale-Hubbell AV® rated attorney, Joseph is among the less than one percent of attorneys who are Florida Bar Board Certified in Business Litigation. Arthur J. Menor is the Managing Partner of the West Palm Beach office of Shutts & Bowen LLP, and Chairman of the Real Estate Leasing Practice Group. A nationally recognized real estate lawyer, Art has more than 35 years of experience in all facets of commercial real estate, focusing on commercial leasing and the acquisition and disposition of commercial real estate. Francis E. Frank Rodriguez is a member of the firm’s Executive Committee, the Managing Partner of the Miami office, and a Co-Chair of the Tax and International Law Practice Group. A Martindale-Hubbell AV® rated attorney, Frank focuses his practice on general business transactions, with an emphasis on federal and Florida tax issues. To view the full list of power leaders, please click here for Part 1 and here for Part 2. Shutts & Bowen, established in 1910, is a full-service business law firm with more than 270 lawyers in offices in Ft. Lauderdale, Jacksonville, Miami, Orlando, Sarasota, Tallahassee, Tampa, and West Palm Beach. Learn more about Shutts & Bowen at www.shutts.com.